President Obama is hosting Astronomy Night on the South Lawn tonight, bringing 150 local middle-school students to the South Lawn to check out more than 20 telescopes and numerous exhibits. 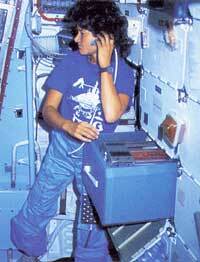 One of the evening’s special guests is Sally Ride, the first American woman to travel to space. In addition to working with the kids at the event, she’s agreed to answer your questions live on the White House website. So starting now, post questions for America’s first female astronaut via facebook and twitter (#WHlive). Whether it is about her experience getting kids excited about science (she’s written five books for kids and developed numerous middle-school programs), questions about the space program or just what it’s like to be weightless in space, she wants to hear from you. NASA’s Dwayne Brown, the senior public affairs officer for NASA’s Science Mission Directorate in Washington, will join her for the chat. He'll choose some of your questions prior to the event, and follow-up questions via twitter (#WHlive) during the chat. Also, if you have a few minutes or hours to lose yourself in our final frontier, check out NASA's website for everything you'd want to know about the space program.